Beam Shapes (or Beam Profile) In DIY Projects – What Should I Use? Whether you’re an experienced DIY builder or brand new to the party, there are often quandry’s about beam shapes. Well, I need to do this, but I only have material like that. I’ll just use it because I have it. These kinds of decisions happen all the time in my shop. How about in yours? Actually, that’s a great idea! — Please take a minute and share in the comments. — Please tell us about a silly thing you’ve built from an obviously wrong piece of material. OK, back to discussing beam shapes. Selecting the right beam shapes (aka section or profile or beam type) is rather important for each purpose. Each and every beam shape has different characteristics, and probably a bunch of different sizes. There are many different standard beam types, and really, an unlimited number when we include the +1, fabricated beams. To start, let’s look at some beam shapes that are common for DIY projects. – We use Stars for general ratings. More Stars mean Stronger, Easier, or More Robust. – The Stars are comparative, so 1 star does not mean it’s bad. – Fewer stars means it’s not as good for that property in comparison to others. – Hover Your Mouse over the stars (and “Profiles”) for information about categories and ratings. Again, Hover over the Stars to read our thoughts for ranking them. * Rectangular Tube discussion includes Square Tube. The ratings for each beam shape (or beam profile) are based on personal experience. I accept a variation of a star or so in any of the columns since it’s pretty hard to define. Some differences exist when thinking about a vertical beam versus a horizontal beam. Some items like corrosion are not as applicable when the conversation turns from steel to aluminum. I also recognize that there are many other beam shapes that can be fabricated. Impossible to put every option on the list. Let’s take a look in more detail for some of the beam profiles as they apply for DIY projects.
. . . (including square tube) is probably the most common material for DIY project. It does well, for instance, in smaller trailer frames. Which stands to reason because it does well at most everything and especially because it’s easy to work with. Also, it’s easy to get in a ton of different sizes and thicknesses. These beam shapes are strongest in the height direction, but certainly not weak in the width direction. Tubes also handle torque well. Painting on the convex shape is easy and you don’t have to worry about spacing to inside flanges. Disadvantages: There are 2 potential downsides for Tube . . . . 1) You can’t paint on the inside very well, so you must seal it to protect from corrosion. That’s usually easy unless you plan to run wires or other things through the very nice and protected central passageway. 2) Depending on the wall thickness, if you place bolts through tube then tighten them, you can squish the tube. They are also longerish. Note that placing holes in the tube goes right back to #1, sealing. Applications: DIY project plans here at Mechanical Elements use a lot of Rectangle and Square beam shapes.
. . . is much like rectangular or square tube for advantages, and this beam profile is superior for torque per weight. It also has the nice advantage of being great to tie to. Disadvantages: Again, round tube has the same disadvantages as above, yet with the distinct additional one of being harder to align and center holes parallel simply because it doesn’t have a flat side to reference. (That doesn’t mean it’s impossible, it just requires a little more effort.) Also, round tube is harder to fabricate because you must shape the ends to Tee into other round tubes. Applications: Round beam profiles are in many DIY projects, especially for connection and spacers. They also appear for things to hold (with a hand) or tie-on.
. . . is a really popular beam profile for auxiliary beams. Though we also see it for main beams, it’s a lot more common for cross members and other places. In the vertical direction (as oriented for the beam profile chart image above), C-Channel is typically stronger for the weight than tube. That makes it attractive, but it doesn’t come in as many different sizes, thicknesses or varieties. Finally, the open section means you can easily finish it all over. Applications: A lot of the Mechanical Elements trailer plans use C-Channel — especially for the front and back frame members. It is also in the Crane Plans for the pedestal foot cross beam.
. . . Also called “Angle Iron” but most of the time it’s steel or aluminum not “iron” like the name implies. This is the “do all” beam profile for a ton of different jobs. Like C-Channel it’s not so good for long unsupported spans, but it’s great for things like cross members and rails because it’s easy to bolt to and easy to join (weld or both) with other members. It’s also easy to protect from the elements. Perhaps most important, Angle is often joined with other materials for a particular job – like this. Angle comes in dozens of sizes and configurations (equal length legs or different length legs). Disadvantages: When using Angle for auxiliary beams, it does many jobs really well. It’s not the strongest section in any direction, so use it for braces, and where you need things attached. Applications: Too many options to list. Angle is in most of our metal fabricating plans in one way or another. It is one of the most versatile beam shapes.
. . . is the quintessential beam profile. The design is super strong in the vertical direction, yet has a uniform and equal response to other forces. It has the best strength to weight ratio (vertical) making it a great DIY beam profile — for Cranes, and for the main beams of big and/or long trailers. Also, it’s open section makes it fairly easy to protect. Disadvantages: The classic I-Beam shapes have angled flanges which do cause some issue when bolting. (Not the case with non-classic beam profiles.) Also, there are not a lot of sizes (in comparison to rectangular tube). 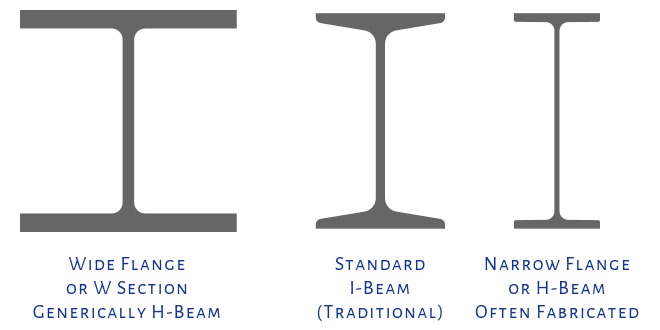 That said, there are variations of the classic I-Beam — like W sections and H sections shown below. Others also exist — especially when you look at shapes for aluminum and other materials. Finally, I-Beams don’t handle torque very well. Applications: As in the advantages above, I-Beams do well for longer beams with a higher load. Things like Crane top beams and things like long trailers with stiffness and/or strength concerns. H-Beams are frequently used for vertical columns.
. . . are represented above by flat stock, but this category covers all of the variations of height and thickness. Solid sections include things like sheetmetal up to thick, square bar stock, so it’s hard to categorize. Solid beam shapes are easy to bolt to and are easy to use for short connective pieces like gussets. The flat and perpendicular sides make drilling easy too (at least in one direction). This beam profile is very versatile especially when we add in all the fabricated and bent beam shapes. Disadvantages: These materials are usually quite strong in one direction, but (depending on thickness) flimsy in the other. They do not handle long unsupported spans well. Applications: Frequently used as gussets and connectors, and for overlapping strengthening pieces. Also for shims or thickness stacks. Flat, solid sections are often bent to provide additional function or places for bolting. There are an infinite number of different ways to fabricate a beam. The sky is truly the limit. While many DIY projects like trailers use standard beam shapes, sometimes a fabricated beam satisfies a special need. Mostly, fabricated beams are made from standard shapes, but when complete, they are their own animal. Sometimes we fabricate beams to address space concerns, or special strength or stiffness concerns. However, the biggest need is to achieve strength and stiffness with a lower overall weight. Here is an example. Disadvantages: The big loss with fabricated beams is the time and effort to set them up and fabricate them. Often they require a lot of cutting and welding and measuring. Sometimes special jigs or fixtures. However, if they make what you’re going for happen, then the amount of work is less of an issue. Applications: All sorts of special reasons. The sky is the limit. Beams come in all the different types because we need them for many reasons. In the table above we mentioned several characteristics that are common to certain beam shapes in the context of DIY projects, and especially trailers. In other words, different areas of a project need different things, so we select a beam profile for those needs. The above applies generally to most DIY projects that use Steel or Aluminum for structural integrity. Certainly Cranes, Presses, and other tools. Next up is applying the above information to specific areas of a trailer frame. Let us know if this information helps as you plan your next DIY project.